Normally used in twin holders with the pedestrian range of machines. Spring and Autumn general purpose aeration of compacted areas to maximum depth. Large core size at 3" x 3" hole pattern. Moderate to severe soil removal. GTH34 Jumbo Tine is normally used on fairways or where a large amount of soil exchange is desired. Part No: GTH58 Socket Size: 3/4" Overall Length: 4 1/2"
Part No: GTH34 Socket Size: 7/8" Overall Length: 4 3/4"
Normally used in Twin tine holders with the Groundsman model 8120 Tractor Mounted machine, however they can be used on the pedestrian range where conditions permit. Spring and Autumn general purpose aeration of compacted areas to maximum depth. Large core size at medium hole pattern (3" x 3"). Moderate to severe soil removal. GTH34L Jumbo Hollow Tine is normally used on fairways or for excessive soil exchange. Part No: GTH58L Socket Size: 3/4" Overall Length: 5 1/2"
Part No: GTH34L Socket Size: 7/8" Overall Length: 5 3/4"
Normally used in triple holders with the pedestrian range of machines however, they can be used in twins for compacted conditions or on harder surfaces such as Cricket tables or Tee boxes and approaches. Spring and Autumn aeration producing a medium sizes core to maximum depth, moderate soil removal. Part No: GTH12 Socket Size: 5/8" Overall Length: 4 3/8"
Normally used with Groundsman model 8120 Tractor Mounted machine fitted to Triple Holders for close pattern hollow coring of Greens etc. Use on Twin Holders for harder more compacted surfaces or if the wider hole pattern is more desirable. These tines can be fitted to the pedestrian machines but preferable on a Twin holder. Medium core size to maximum depth with moderate soil removal. 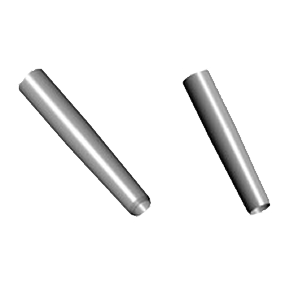 Part No: GTH12L Socket Size: 3/4" Overall Length: 5 1/2"